My name is Tim and I am an officer in the British Army. Last year my commanding officer, a Fellow from Cohort 1, Rob Hedderwick, introduced me to Adam and Ruth and asked them if they would be willing for me to join their Forward Institute family for a few months this summer. I have just finished my secondment and it was utterly extraordinary. Extraordinary!!! That they were so willing to take an Army officer on-board demonstrates how much they value the relationships they have with their partner organisations, and how willing they are to invest in them to deliver institutional change. Well, I thought that I would be shadowing and supporting other team members with their work - that I would learn through observing, but as I’ve learnt, this is not the Forward Institute way. From my experience, the Forward Institute believes in taking action, in learning through doing. They immediately made me feel part of the team and put me to work in four areas. The first three roles focused on attaining the company’s certification as a Benefit Corporation (B Corp), delivering improvements where required - namely enhancing the company’s event planning and processes and finally, identifying areas to improve their support to the Army. The final set of responsibilities I was given were all personal development aims. Despite only being with the team for four months, they were keen to support my longer-term development. It made me feel truly valued. The best thing about working with the Forward Institute was the exposure to genuine diversity of thought. I learnt so much from the team and the 25 major organisations that they work with. I also had, for the first time in my professional career, time to genuinely reflect. This combination was potent and I believe that I return to the Army better as a result. Better as a leader, but also better as a person too. Is there anything you'd want to say to Cohort 2018 given what you’ve seen of the programme since you’ve been with us? So, to those of you lucky enough to shortly be starting your Forward Institute journey, you are about to join a remarkable family. At the heart of it is a wonderful team of extraordinary people, united by a powerful cause. Kind, generous and caring, they will challenge you, push you and support you to go further. The 18-month programme is only the beginning though – from talking to Fellows from previous cohorts in the Army as well as outside of it, you are likely to continue a relationship with the Forward Institute and the great people you meet on the programme far into the future. I know my relationship will continue too. 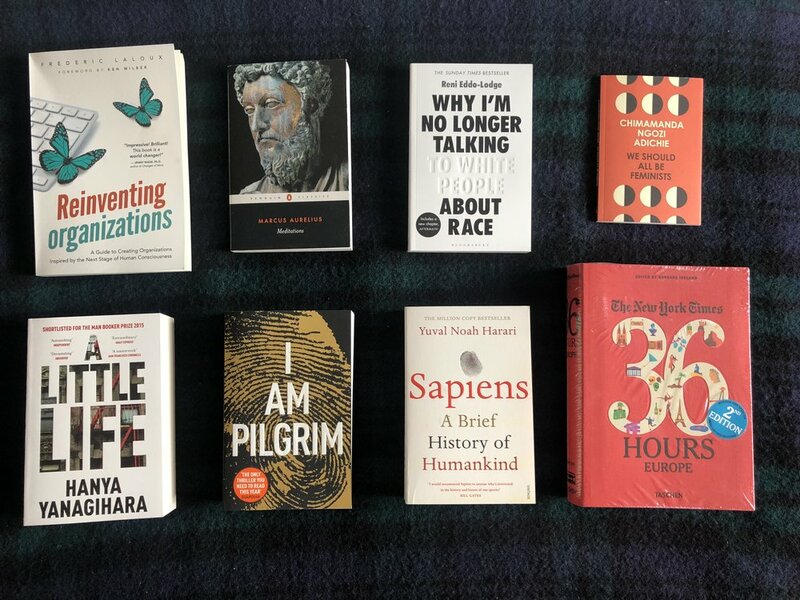 The impact of external stimulus and diverse thought is increased through prolonged exposure and with this in mind, the team very kindly sent me on my way with a great collection of books. I think the range and topics speak for themselves and show the breadth of the types of people in the team and the inspiration that they are.